What Will Our Future Be Like If We Don’t Change How We Get Around? How will Americans get around in the year 2030? A recent report from the RAND Corporation lays out two “plausible futures” developed though a “scenario analysis” and vetted by outside experts. While RAND takes a decidedly agnostic stance toward the implications of each scenario, the choice that emerges is still pretty stark. In the second scenario, “Fueled and Freewheeling,” oil prices are relatively low in 2030 due to increasingly advanced extraction methods. Americans’ relationship to energy is much like it was in the 1980s and 1990s. We’ll own more vehicles overall and drive more miles. Suburbanization will continue. Roads are in bad shape because no revenues are raised to repair them. Congestion is worse. This scenario represents the future if little action is taken to counter the effects of global warming. 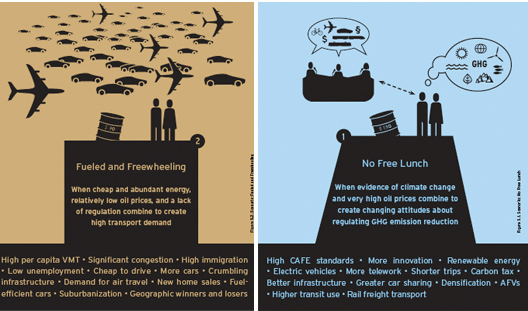 The difference between the two scenarios boils down to three factors: oil prices, level of regulation, and highway revenues and expenditures. While we might not have a great deal of control over oil prices, the other two, RAND points out, fall within the range of public policy. So in that sense either future is plausible. In both cases the economy is healthy, though RAND thinks that in the “No Free Lunch” scenario, the U.S. economy grows about 2 percent annually, compared to 2.5 percent in the scenario with terrible congestion on crumbling roads and, presumably, catastrophic climate change on the horizon. RAND forecasts that in neither scenario will intercity rail travel represent an appreciable portion of total travel, nor will self-driving cars be a major share of vehicles. A few aspects of the report are odd. In the scenario where America does something about climate change, “greater densities” are for some reason attributed to “new zoning restrictions,” not the loosening of pervasive zoning rules that compel sprawling, single-use development with tons of parking. And RAND didn’t analyze health and safety effects in its scenarios. Even though it must be a safe bet to predict that in a future where Americans are driving less and walking and taking transit more, thousands fewer lives would be lost in traffic each year, and people would be living longer thanks to the additional physical activity in their daily routines. Latest thought I’ve had on self-driving cars is that they are likely to put more cars on the road and make driving less pleasant for human-driven cars. “More cars on the road” because of induced demand — the time and stress of driving long distances or putting up with traffic jams is are “costs” that limit how much people are willing to drive. Self-driving cars will remove that cost. Parking is likely to get worse, especially if a self-driving car is allowed to drive itself to parking with no human in it. It can afford to circle endlessly looking for the last remaining place to park; humans can’t compete. I’d predict congestion charges and/or more expensive parking would both be put in place to limit these things. There are other more beneficial ways we could imagine using self-driving cars, but we could also imagine a better transit system with existing technology. Assume people will narrowly do what they want to do. Can you imagine how stressful it would be, as someone who´s driving a normal car, to be tailgated by a self-driving car where the person behind the wheel is reading a book or eating or sleeping? Presumably, the operating system of the self-driving car will be programmed to maintain a safe following distance. Even automated systems aren’t instantaneous (something I’ve noticed when changing channels on a present-day TV set), and slowing or stopping a car takes a finite amount of time for the mechanical and hydraulic systems to work. Presumably the person programming the car would have it drive more sensibly than your average, aggressive driver. You’re not thinking like a NIMBY: If self-driving cars take up too much parking, we’ll just prohibit parking self-driving cars on street parking. Aha! Something most people miss when talking about self-driving cars is the idea of safe following distance. The only reason that all the cars even fit on the highways at rush hour in major metro areas right now is the fact that many human drivers are not maintaining safe following distances. If they did, there would literally not be enough space at any given time at rush hours to hold that many vehicles on these stretches of highway. As indicated above, self-driving cars actually exacerbate many of the resource and safety impacts of automobile overdependence. For the foreseeable future (next few decades), self driving cars will be very expensive. The cost of the necessary hardware (radar etc…) will be cost prohibitive for widespread adoption. You will at most see the cars replace professional drivers. Think truck drivers, or cab drivers. In the latter case, there is the promise of a better part time car program (like zipcar), but only in areas where they can be used frequently, i.e. cities. Let’s not forget DUI sudden non-drivers. What? You guys can use the googles for this kind of stuff. Automated car linkups have been tested for like years now, and no, the cars do not need lots of following distance because computers don’t have the reaction lag that the human brain linking to the foot does. I think the original point is that if a self-driving car is following a human-driven car, then it will maintain a safe following distance, rather than attempting an automated car linkup. Why would a self-driving car circle endlessly looking for the last remaining place to park? A self-driving car would be perfectly happy driving four blocks away to an underused parking structure, or more likely, driving half a block to a person looking for a pickup, since a self-driving car is more likely to function as a taxi than as a personal vehicle. But you’re probably right about them putting more cars on the road and making driving less pleasant for humans. It would be fantastic if the self-driving car picked people up and acted as a taxi, but what car owner is going to allow their car to be used like that? You’re right, that it will drive to the underused structure — and I’m not sure what that means. Will parking spill out of expensive areas into lower-priced areas? It seems like it should. How does the Rand Corporation see a scenario where oil prices stay cheap? Recent reports from groups like Post Carbon Institute are that the shale oil boom will peter out because the wells drop from peak production in a matter of a year or so, and the investment needed to get oil out of the shale and tar sands is several times what it takes to get comparable oil out of deep sea wells. Oil prices are a significant factor in virtually everything we consume (we ‘eat’ nine calories of fossil fuel for every calorie of food we eat, thanks to processing and shipping). Before we take these estimates seriously, we need to know how Rand arrived at a cheap oil scenario in the first place–it runs counter to much of the information that’s out there in terms of the future of energy use. Assume, for the sake of argument, that oil merely gets somewhat more expensive; that we will get better at extracting it from shale and tar sands, and that reductions in demand (here in the US yes, but not in China, oops) will blunt the price spikes. And I think you may overstate the energy costs of food — are you sure you’re not talking about some of the worst-case items, or a poorly weighted average? There are common foods that are energetically much cheaper than that. Knock the dead mammals, deep sea fish, and wild-caught shrimp out of our diet and it’s not so bad. The fuel numbers have gone up since then owing to more and more of our farming being done on less-than-ideal land that must be heavily fertilized and irrigated. That sounds like a weighted average, compared to the numbers from Pimentel & Pimentel (Food, Energy, and Society, 3ed for page numbers). If costs go up, weights will change, blunting the proportional increase. There’s tons of room for improvement, and the transportation systems will adjust as well if costs rise. Peanuts (p.117), yield 1.4 kcal output for 1 kcal input, including “transportation” and “electricity”. Apples (p. 122), 0.6 to 1. Oranges, 1:1. Potatoes, 1.3:1 (1.5:1 in the UK). Spinach, 0.23:1. So 4x for the spinach. And farm-produced fish/shrimp/oysters (p. 87 and following) are insane — the numbers look more like 1:65, 1:70, 1:90. (Catfish, is “better” at 1:34). Wild caught (p.84), varies from 1:2 (herring) to 1:192 (lobster). Farmed shrimp is “better” because wild caught is 1:150. So I think you’re looking at a weighted average, and the distribution matters very very much. Suppose 10% of your diet is 85% lean hamburger. Replace that with chicken and do nothing else, and your 7:1 aggregate drops to 5.2:1. And if energy gets expensive enough to matter, we’ll see the price signals in our foods, and make that shift; we won’t need to consult academic tomes to know these numbers. My thoughts on the Rand study are at http://www.cnu.org/cnu-salons/2013/12/two-implausible-scenarios . My two sentence summary: if energy prices keep rising, there will be pressure to reduce fuel taxes and environmental regulation, not increase them. So we will probably have one or two elements of each scenario. A self-driving car has no reason to circle endlessly spending time. It would be much cheaper to drive itself to some other location with parking available. Moreover, self-driving cars are more likely to be used as car share or something like that. The major (though not the only) reason most personal cars stay unused, stationary and parked more than 90% of time is because they need to be near the driver and readily accessible. It is an immense waste of capital, if you think that the total resale value of all US car fleet, for instance (excluding commercial trucks), is on the ball of US$ 1,3 trillion. I’m not saying everybody would stop having an own car, but many people could consider using reliable car-share schemes where one books a vehicle and the vehicle is at his/her doorstep in less than 4 minutes or so. This would also impact the way cars are designed, aiming for more efficient models (be them electric, liquid fossil fuel or hydrogen powered) . You’re making the same mistake I made (before), which is only wearing rose-colored glasses about the wonderful things these cars *could* do. We can do car-share already — there’s ZipCar for short-term rentals, there’s Carma (formerly Avego) for casual carpooling. They’re still very much niche markets. Plain old carpooling used to be more popular than it is. People prefer not to share, if they can afford that option. Assume instead that people will continue pretty much as they are — they prefer to ride in their own car. If you’re using your car as a rolling office, perhaps even more so — a car is even smaller than a cubicle, you’re not going to want to share it with some other guy yacking on *his* cell phone, or tapping loudly on his laptop. Think about who buys the first self-driving cars — it will be people whose time is valuable, and the cars will be expensive. And yeah, they could do wonderful things. Truly self-driving cars ought to allow you to completely rewhack a transit system. Replace busses with small self-driving vans and sedans, automatically dispatched to minimize aggregate time and distance, allowing passengers to pay a premium for express service (that should still be well less than a taxi), it could be very interesting. A world with self-driving cars dominating the market is still better than one with plenty of Zipcars around. For instance, we could get rid of all street parking that lasts anytime more than 10 minutes, as cars can self-store themselves on purposefully-built facilities tucked away from streets. If self-driving cars are deployed in the way that they need to be in order to be effective (and in order to not make life hell for those of us on bicycles) is for each car to link up with others to form a sort of ‘road train’. Cars would be able to attach and detach from the road train to head to their individual destinations. I own a car, but would gladly own a motorcycle instead – the only thing that keeps me from getting one is the fear of getting taken out by an incompetent motorist. With a well-programmed AI, that’s taken out of the picture, making human-driven motorcycles an increasingly attractive option. Which will make human-driving/parking ever-so-pleasant. The transition will be interesting times. I could easily see people getting all Luddite about how the robot cars are taking “their” parking spaces, etc. Of course. Sprawl doesn’t happen because we run out of room in the core — it happens because the jurisdictions on the periphery “incentivize” it for their own economic development purposes. The ONLY way that stops quickly (and yes, 2030 is only 16 years away, which is a very quick time horizon for land use change) would be for a relatively large government body (either state or region) to “regulate” (a.k.a. forbid) developments at the edges of metropolitan areas. Otherwise, it’ll be a long time before greenfield development gets a lower expected return on capital than infill development, primarily due to how much risk is borne by governments vs. industry. I personally don’t think there’s going to be a long period where you have both self-driven and human-driven cars on the road. Insurance rates will see to that. Most existing cars can be retrofitted for self-drive once AI is up to par. When that happens, insurance rates for any car which has the option of being driven by a human will skyrocket to the point only the wealthy can afford it. Once only a few wealthy can afford to drive, it’ll be pretty easy to pass legislation to forbid human driving on public roads altogether. I’d say within a decade after significant numbers of self-driven cars appear the days of human-driven cars on public roads will be over. Bankrupt localities will only push us faster towards this given the considerable savings on emergency services, licensing bureaus, and traffic patrol which self-driving cars will enable.